Railpictures.ca - A.W.Mooney Photo: (Photo 1 of 2) This is the sprawling CN facility at Fort Erie as it looked in early 1984. One can see the turntable and roundhouse in extreme left background, toward the centre the CN shop building; capable of extensive repairs, and to the right of that, fueling area, CN offices where paperwork and scale records kept; and on this day very little traffic in the yard. Lower right is the mainline. CR 2286, 5435 and 7548 have a fair sized train to return via the International Bridge, after bringing in Canadian traffic a few hours earlier. Photo taken from Central Ave bridge. Yeah, it is all gone now but the mainline. The CN main shop building still stands, rather forlorn looking, as the home of the fledgling Niagara Railroad Museum. It is worth a visit. | Railpictures.ca – Canadian Railway Photography – photographie ferroviaire Canadienne. 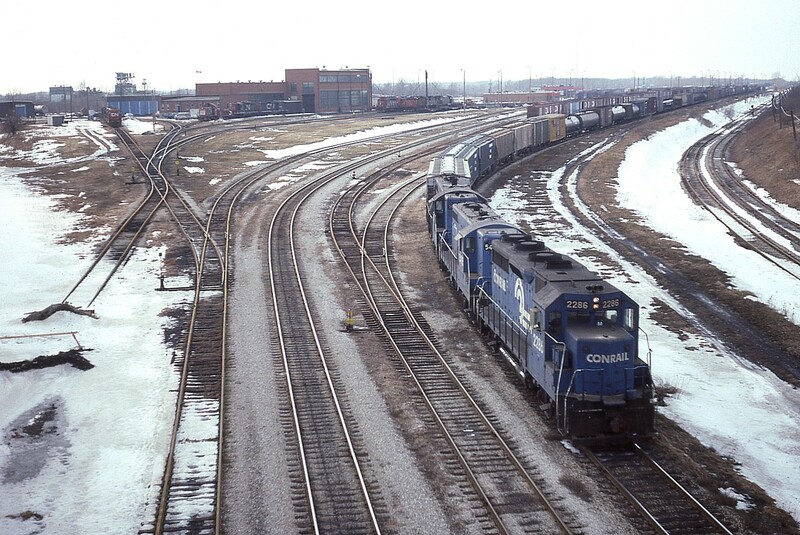 Caption: (Photo 1 of 2) This is the sprawling CN facility at Fort Erie as it looked in early 1984. One can see the turntable and roundhouse in extreme left background, toward the centre the CN shop building; capable of extensive repairs, and to the right of that, fueling area, CN offices where paperwork and scale records kept; and on this day very little traffic in the yard. Lower right is the mainline. CR 2286, 5435 and 7548 have a fair sized train to return via the International Bridge, after bringing in Canadian traffic a few hours earlier. Photo taken from Central Ave bridge. Yeah, it is all gone now but the mainline. The CN main shop building still stands, rather forlorn looking, as the home of the fledgling Niagara Railroad Museum. It is worth a visit. Verrrrry nice. I might be able to time machine this with NS 327….! in 2006.